Strips of thin card 4cm wide, cereal boxes will do, you'll need approx 90cm length. 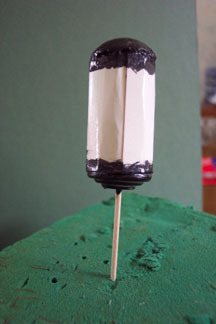 Tightly roll the card around the skewer, joining as necessary untill you have a thick tube 2.5cm in diameter. Glue end to hold in place but not to skewer. Cut out the middle of the grommet using sharp scissors, you need this piece to measure 2.5cm in diameter too. Push a hole in the centre of the grommet with the sharp end of the skewer. 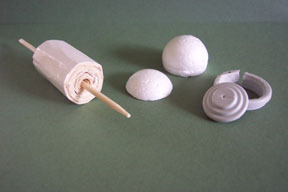 Cut the cotton or polysyrene ball in half. Note.. I only had a 3mm size one so it was a bit big so I only cut off about a third of my ball and trimmed it to fit, it doesn't matter. 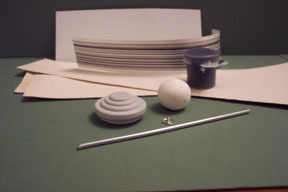 Glue the grommet to one end of the tube and the 1/12 ball to the other. Let the glue dry then paint both ends with black acrylic paint. When the paint is dry glaze over it with a thickish layer of PVA glue. This will take awhile to dry but adds a good shine. Note.. I have mine perched on a cocktail stick stuck into some old oasis to hold it all in place during the painting process. 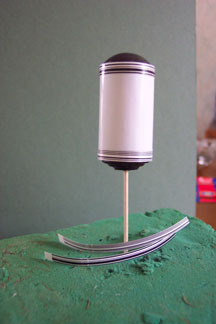 Now tightly roll the photo paper around the card tube, it should be just wide enough to hide any joins, glue into place. Cut some strips of barcode label to about 1/12 cm wide and use to decorate the top and bottom of the photo paper. Note.. an alternative to this would have been to print some lines on the photo paper before attaching to the card tube. This bit is difficult to describe and doesn't need to be too precise so do check out the picture. Using the pliers bend the metal tube a little, about 1/12 cm from the end, move along the tube another 2.5cm and bend the tube the opposite way, move along the tube again about another 3cm and bend the tube back along itself, finally bend the last 1cm outwards. 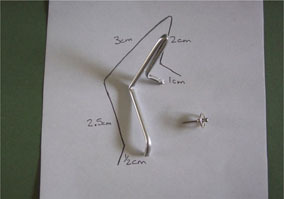 Push the dressmakers pin through the presstud and use the pliers to trim to 1cm. Put the pin with the presstud into the bent out 1cm piece of metal tube and glue into place. When the glue is dry firmly push the doubled piece of metal tube into the hole in the grommet. You might have to enlarge the hole slightly but keep it as small as possible as it needs to hold the metal tube strongly. A tiny piece of glossy black paper or card stuck on the front to look like the pilot light opening just finishes it off. 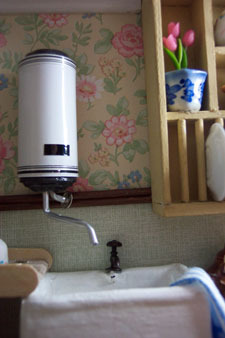 Glue to the wall over the sink, sit back and admire. 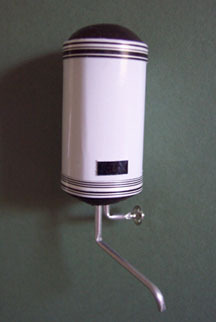 This D.I .Y.Doll's House Ascot Boiler Tutorial is the work of Carole. Build your own Dollhouse ! This link will take you to Jennifer's[my] dollhouse.